As a manufacturer of aluminium packaging, Al Pack Group offers high quality solutions for packing, such as lids, containers, lacquered and laminated aluminium foil, and labels. Through many years of experience in the production of deep-drawn containers and lids, we are known in the market by the Alster brand which represents laminated foil products that are used in the meat processing. We apply multiple types of embossing lids: worms, lined, needle-like, damask, circumferential, 3D (exclusive) and dotted separation lacquer, while containers may be round, square or of special shape by the customers’ demand. Within the Group, the departments of prepress and production of clichés that give us complete control of the printing process function independently. Our quality control and R&D sector are equipped with an internal lab that provides quick and independent testing, analysis and development. We see a great advantage in our own production of tools for cutting and deep drawing, as well as home-clearance, which allows a short delivery time. Our products are widely used in food industry (milk, meat, confectionery, pet food, coffee industry, the industry of jam, honey, compote, as well as water and soft drink industry), pharmacy and cosmetics. Highest Quality - Al Pack is constantly working on the development of its production and quality systems to fulfill high expectations of its customers and, more often than not, even to exceed them. Organization - We have dedicated people for all major functions. Internal discussion happen every day so we have a very fast response to any request. Customer satisfaction - Al Pack orients its business politics towards the individual needs of its customers, from tailored offers to custom-made product development. Your comment and advice really matters! Precision - We like to speak in numbers. You always get what you asked for. Service excellence - Our highly motivated, professional staff is always available to our customers. No matter if it’s a minor or major demand, our extensive portfolio of services always puts our customers in the center. Leadership - Owners and managing staff are very motivated with a lot of knowledge in this field. Adaptability - Custom requests is a standard procedure for us. We are able to optimize our production process in the way that suits you most. Environmental and social responsibility - We are proud that we have a leading role in environmental protection among packaging companies in Serbia. As one of the fastest growing companies in the region, we build on the sustainable interaction with man and nature. Al Pack d.o.o. 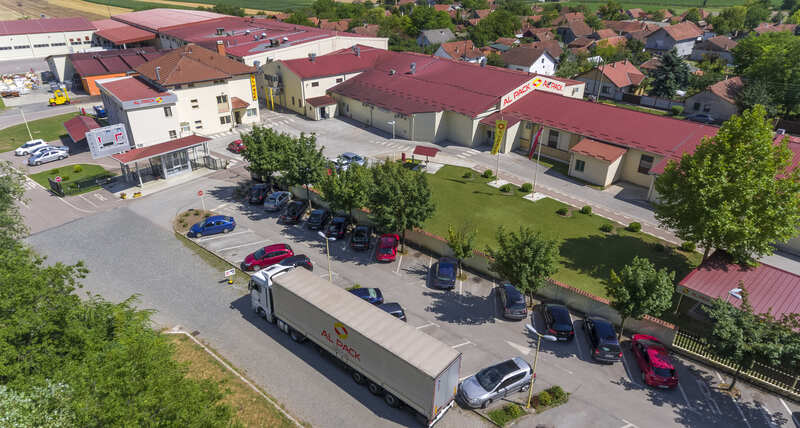 from Subotica, the parent company of the Al Pack Group, has had its own expansive business flow for more than 20 years, in which it gradually developed its infrastructure, technology and professional staff. Since the establishment in 1994, side by side with its customers, it has been moving to the future with advanced products and innovative ideas. In 2007, it successfully bought a factory for machining metals, which grew into a responsible and independent company, Metal Production Engineering, based in Belgrade. After decades of operating in the Russian Federation market, in 2014, Al Pack opted for new investment and the opening of an office named AL PAK RUS in the Russian capital. Analyzing internal resources and the environment, the Al Pack Group has made a successful acquisition of a German manufacturer of aluminium lids, Uniprint Knauer GmbH & Co. KG. This growth strategy got the Group a new member based in Aichstetten, Al Pack Uniprint, on 01.01.2016. Today, the Al Pack Group operates in over 25 countries in Europe, it has over 280 employees at 4 locations and continues its expansion with a clearly defined strategy.